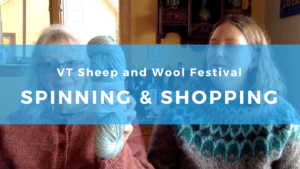 Sarah’s mother (and Chief Fiber Arts Enabler) Nancy Hart joins for a chat about the 30th Annual Vermont Sheep & Wool Festival. The Vermont festival is always our favorite of the year. Held in our home village of Tunbridge, this medium-sized festival attracts vendors and fiber fans from around New England and beyond. This year we were able to take a spinning class together on Thursday before the festival started. Then on Sunday, Sarah did a free demonstration about using a Norwegian knitting thimble to manage two yarns for color work and double knitting. The Vermont Sheep & Wool Festival is held every year during the last weekend in September. Our spinning class was led by Jillian Moreno, and we highly recommend her book, Yarnitecture: A Knitter’s Guide to Spinning. Into the Whirled makes beautiful batts and braids for all you hand-spinners out there. Fiber friend Anne Choi runs a small flock of sheep at Middle Brook Fiberworks and teaches tapestry weaving. Patricia of Tidal Yarns dyes her New England sourced fibers with natural dyes for a beautiful muted palette. Check out her Instagram @tidalyarns for pretty yarn. Sharon of Orange Cat Soapworks makes lovely goats milk soap that we both use as a moth preventative for our wooly goods. You can find her on Etsy seasonally. Michael Hampton released his newest line of yarns, dyed-in-the-wool and then spun at his mill. If you want more Michael, check out our interview with him. Nancy mentioned helical knitting and you can learn more about this technique from Jen Arnall-Culliford’s blog and upcoming book. The Spinning Studio in Bradford, Vermont, makes beautiful wall hangings and sells needle-felting kits. They don’t have an online presence but you can call them at (802) 249-4715.